T-cell development endows cells with a flexible range of effector differentiation options, superimposed on a stable core of lineage-specific gene expression that is maintained while access to alternative hematopoietic lineages is permanently renounced. This combination of features could be explained by environmentally responsive transcription factor mobilization overlaying an epigenetically stabilized base gene expression state. For example, “poising” of promoters could offer preferential access to T-cell genes, while repressive histone modifications and DNA methylation of non-T regulatory genes could be responsible for keeping non-T developmental options closed. 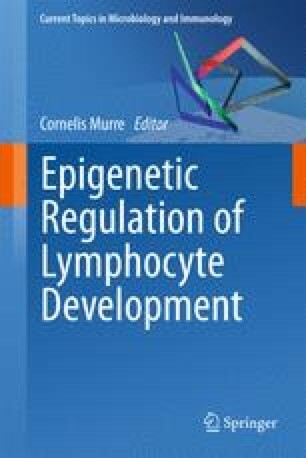 Here, we critically review the evidence for the actual deployment of epigenetic marking to support the stable aspects of T-cell identity. Much of epigenetic marking is dynamically maintained or subject to rapid modification by local action of transcription factors. Repressive histone marks are used in gene-specific ways that do not fit a simple, developmental lineage-exclusion hierarchy. We argue that epigenetic analysis may achieve its greatest impact for illuminating regulatory biology when it is used to locate cis-regulatory elements by catching them in the act of mediating regulatory change. We gratefully acknowledge Georgi Marinov and Ali Mortazavi for help with software conversions between mm8 and mm9 mouse genomic coordinates, and members of the Rothenberg lab for stimulating discussions. The authors were supported by grants from the NIH, 5RC2 CA148278-02 and 3R01CA090233-08S1, and by the Albert Billings Ruddock Professorship (E.V.R.) at the California Institute of Technology.